Harold Camping, owner of the Family Radio Network who has set the date for the Lord's return at May 21, 2011, has invented an end-time scenario that is right out of Alice in Wonderland because it is based on twisted scriptures, allegorical imaginings, and number tricks. Below is a summary of it.1 Let me warn you that before you read it, you'd better sit down and take a deep breath! The Church Age ended on May 21, 1988 and the Tribulation began that day. Between May 21, 1988 and September 6, 1994, the first six years of the Tribulation, almost no one was saved. On September 6, 1994, God began to pour out His Spirit. This will result in a great end time harvest of souls during the last years of the Tribulation. Since the Tribulation will last 8,400 days or 23 years, dating from May 21, 1988, the Rapture will occur on May 21, 2011. Those left behind will be judged by Jesus for a period of five months, until October 21, 2011, at which time the world will come to an end. He begins his explanation by asserting that the first Jubilee Year after the re-establishment of Israel in 1948 was 1994. Then he says that because the last part of the Tribulation is identified with a great multitude to be saved (Revelation 7), the last part of the Tribulation must have begun in 1994, since it was the first Jubilee Year since the re-establishment of Israel in 1948. He then explains that because the first part of the Tribulation must be identified with the 2,300 days of Daniel, the Tribulation must have begun 2,300 days earlier, which would place it in 1988. And since the Church was established on the Day of Pentecost, the end of the Church Age must have occurred on the day before Pentecost, which in 1988 was May 21.
Who says the first Jubilee Year in Israel after the re-establishment of the state was 1994? The Jews make no such claim. According to Jewish traditions, the very first Jubilee Year was celebrated 50 years after the Jewish people entered the land of Canaan.2 Accordingly, it would seem logical to assume that a resumption of the Jubilee Years in modern times would start with the year 1998, 50 years after Israel was re-established in 1948. But the fact is that the Jubilee Year today is neither calculated nor celebrated because the Jews believe there can be no celebration of the Jubilee until a majority of all Jews, representing all tribes, are back in the land. So, Camping's very first step in his calculations is totally invalid. Who says that the last part of the Tribulation is to be identified with the great host of saved people who are pictured in Revelation 7 as Tribulation martyrs? The chronology of Revelation puts these people in the first half of the Tribulation, not the latter part. Where does he get the idea that the last part of the Tribulation is going to be a great time of world wide evangelism and soul-saving? The book of Revelation pictures the last half of the Tribulation as a time of absolute chaos on earth. Who says the 2,300 days of Daniel 8:14 must be identified with the first part of the Tribulation? This is not even an end time prophecy! Who says the Church Age must end on the day before Pentecost? The Church Age will end when the Church is raptured out of this world, and that is an event that can occur at any time. Another question Camping's end time scenario raises is, "How did he come up with the date of May 21, 2011 for the Rapture?" The answer is simple. He just asserts that since the Tribulation lasts 23 years, the Rapture will occur on May 21, 2011, because that is 23 years after the Tribulation began on May 21, 1988. I was never able to figure out how he arrived at 23 years for the length of the Tribulation when both Daniel and Revelation make it clear that the Tribulation will last 7 years. I'm sure his answer is there somewhere, based on allegorical interpretation, but I couldn't find it. All of which reveals another trick this master magician uses. His writings are so obtuse as to be indecipherable, a technique that convinces many people that he must be a profound thinker who has received revelations from God that are beyond the comprehension of the average person. Another question which he does answer is, "Where does he get the idea of a five month period of judgment following the Rapture?" You're not going to believe this, but he points first to Revelation 9:5 where it states that one of the Tribulation judgments of God will be locusts who sting like scorpions, a judgment that will last for five months. The passage is, of course, talking about one of the seven Trumpet judgments that will take place on the earth during the first half of the Tribulation. The second passage he points to is just downright surreal. He cites John 21:11 where it says the disciples caught 153 fish! He interprets this allegorically to mean that there will be 153 days of judgment after the Rapture (or five months). Do you see how allegorical interpretation results in the interpreter becoming God? It's because he can make the scriptures say and mean whatever he pleases. To compound the idiocy, Camping then claims that he can prove that the number 153 has great theological significance. After all, he points out, 3x3x17=153. So, what's the significance of that equation? He asserts, without proof, that the number 17 stands for Heaven, and the number 3 represents God's purpose. So, the equation means, "God's purpose (3) is to take people to Heaven (17)." And the number 3 is doubled to signify that God really means what He says! He then fails to explain how this has anything to do with 153 days of judging the lost. Of course, another question I would like to ask Camping is, "How can we be in the Tribulation when the book of Revelation teaches that one-half of humanity will die during the first 3 1/2 years when the Antichrist is conducting wars that will enable him to conquer all the earth?" Where are those wars? Where is such a death count? Where is the Antichrist? 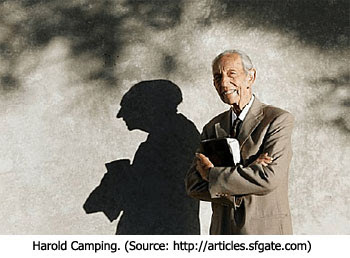 In the next part of this series examining the madness of Harold Camping's date-setting, we'll look at Camping's obsession with playing the numbers. 1. Harold Camping, We Are Almost There! (Oakland, CA: Family Stations, Inc., 2008), pages 47-48. 2. Rabbi Shraga Simmons, "What is the Jubilee Year in Judaism?" http://judaism.about.com/od/prayersworshiprituals/f/jubilee.htm. Dr. Reagan said “…His writings are so obtuse as to be indecipherable..."
Obtuse writings such as nutty Nostradamus, or maybe he is just dyslexic, poor chap! *blinks* What Harold Camping believes gets nuttier with every post in this series. Must remember to keep links handy in case somebody asks what I think of the May 21, 2011 date.